We’ve all been there. We’ve overindulged and lived to regret it. Too many glasses of alcohol or beverages and you feel like absolute garbage the next day. A chocolate cake or truffle that turns into 3 slices brings on guilt and remorse. Tacos or chips or pizza at 2 am? Sure! Why not? Everybody feels remorseful if they think about their so called “happening” life which included lots and lots of high calorie foods, high intake of sugar and other eateries. People treat social gatherings as an excuse, which left them ashamed, bloated the next morning. And then people restrict themselves by simple diet for some days with inclusion of “temporary exercise” and by punishing themselves not to eat any processed foods to their routine just to get their bloating down. I also know how frustrating it can be! Much of the weight gain that occurs over the age of 50 is due to a decline in healthy eating habits and exercise. But fortunately these habits can be reversed, regardless of your age. And the most important thing is these changes are not so difficult that you are tempted to abandon them. Some small but significant changes should be there, which will help you to lose weight. Once you cross the magical 50 year mark you should do smart planning. Gone are the days of pizza, ice cream, chocolates not affecting your waistline, health or energy level. Exercise is certainly required component of proper fitness, but nutrition is much more important for weight loss after 50. As soon as you will be 50 years old you will notice little stiffness and soreness in the bones and muscles than they were a few decades ago. Then, there is also a issue of ever slowing metabolism. There are numerous of roadblocks people in their 50’s will face or still face when they try to lose weight. People who are in 50’s or just entered the league of 50’s gain weight because of work pressure. I mean being workaholic cannot only stress you out but also lead in weight gain, but its more than likely requiring than you spend hours in front of computer screen, not moving much. Instead of burning few calories this inactivity can cause to put on few pounds! Not getting enough sleep is also a major issue that you are gaining weight. Today more and more people are included in the percentage of gaining weight because of stress. Whether you are stressed about your job, home life or something else, you could be setting yourself to put on more weight. Mostly these days people are so busy that sometimes they don’t have time to do lunch or sometimes when they get time they indulge themselves with processed foods. Processed foods are off course delicious but it is very much harmful as they contain high calorie as their fat counterparts and aren’t really all that healthy at all. At this age there should be high intake of fiber rather than all these delicious but dangerous foods! Dear people try switching to a higher fiber diet. Some people smoke to release all their stress and tension. But smoking plays a positive role in gaining weight. At fifties you need to change your inactive or sedentary life style. Sometimes, your life with undergo small changes that you may not even be aware of related to your eating habits and fitness regime. Skipping meals is also one of the of the most bad habit, it can slow down your metabolism and cause you to over eat when you actually sit for your meal. So, it is better to avoid skipping meals. Maintain your diet schedule – follow the diet which contain plenty of fiber. This helps to lose your weight fast, improves digestive functions and rids the body of toxins. Eat food which is rich in antioxidant. Include fresh fruits and veggies in your meal. Avoid foods and beverages that high in calorie and sodium. Try to eat 5 to 6 small meals in a day rather than eating 2 or 3 large meals. And include oats, vegetable sandwiches, soups whole grain salads into these small meals. Reduce consumption of coffees, colas. Eat calcium based products. Drink plenty of water – You must drink 6 to 8 glasses of water on regular basis. The water that you need to consume on a specific day may differ from the needs of someone else, especially when they are staying indoors while you are outdoor underneath the hot sun all day! By drinking a lot amount water each day, your organs will be able to function properly and it will also helps in losing weight at 50. Instead of planning to have an alcoholic beverage of any aerated drinks you must drink water. Embrace weight training – once you hit 50 you have got about 20 percent less muscle mass than you did when you were 20. You should do weight training because that can increase your muscle mass and able to retain the ability to lose weight like you were 20 years ago. Weight training is the key to long term benefit . Importance of walking – This activity melts away the pounds, tone your flabby bits and leave you on an emotional high. All you need to do is walk. Walking is a refreshing alternative to complicated aerobic routines and overpriced gym memberships. It is free, enjoyable, and can be a part of everyday life. Walking is a perfect technique to burn fat quickly and effectively. When a person enters into 50’s there are high risk of falling prey to chronic diseases such as diabetes, osteoporosis and heart diseases. Walking enhances cardiovascular fitness, it reduces the risk of heart strokes, chances of hypertension etc. Increased muscle strength and endurance reduced body fat. 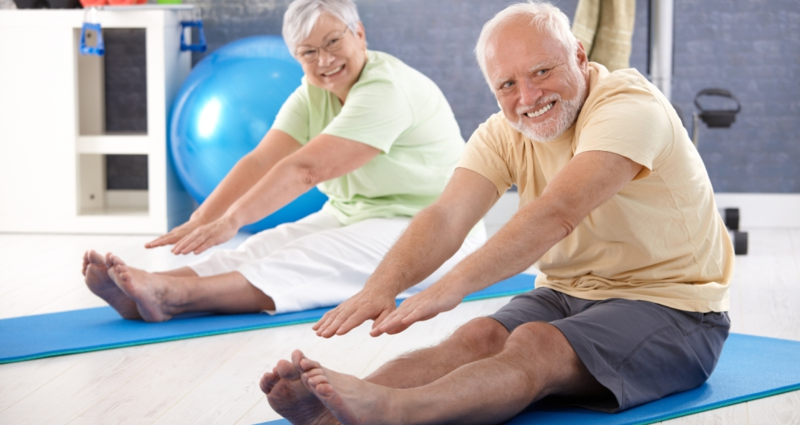 Balance and flexibility – adults above the age of 50 are at higher risk for falling and suffering bone fractures. An effective fitness program for older adults incorporates balance and flexibility, exercises to prevent falls. Such as yoga. Yoga is not only safe for old practitioners but also effective in keeping the mind and body in good health.